While I love the convenience of store-bought almond milk, sometimes it’s fun to make it yourself! This recipe allows you to control the amount of sweetness and infuse flavors as well as play around with the thickness. It’s my go-to when I’m craving homemade dairy-free milk. Simple homemade almond milk that's creamy, delicious, and entirely customizable! Perfect for cereal, baking, and drinking straight alongside baked goods. Add your soaked almonds, water, salt, and any additional add-ins (optional) to a high-speed blenderand blend until creamy and smooth. Keep it running for at least 1-2 minutes so you get the most out of your almonds. Strain using a nut milk bag or my favorite trick - a thin dish towel. Simply lay a clean dish towel over a mixing bowl, pour over the almond milk, carefully gather the corners, and lift up. Then squeeze until all of the liquid is extracted. Discard pulp, or save for adding to baked goods (especially crackers). Transfer milk to a jar or covered bottle and refrigerate. Will keep for up to a few days, though best when fresh. Shake well before drinking, as it tends to separate. *Nutrition information is a rough estimate for 1/2 cup of 10 total servings calculated with 5 cups of water, no additional add-ins and the remaining almond pulp nutritional content subtracted. *This is not my original recipe but my take on many almond milk recipes I've found and tested. *Recipe makes ~5 cups almond milk. Found this recipe helpful? Check out our Guide to Dairy-Free Milk! I drink a lot of protein shakes and have been looking for a good almond “milk” recipe as a substitute for dairy. I love this recipe! I only add vanilla extract to give it a ‘lil razzle dazzle. Soooo easy and fresh!! I’m going to see if it’s cost efficient but I think I will continue! Question: How did you configure the nutritional values? I’m trying to input in my Carb Manager app and I’m not sure how to because it gives me the carb count for the raw almonds, not milked… help! can i use sliced raw almonds instead? thankyou! Haven’t tried this but have made nut “milks” in the past. One suggestion I read somewhere, which is cheap and successful, is to use the strainers painters (house painters) use to strain paint. Elasticated around the edge, so you can drape it over a bowl – just don’t plop the “milk” into it too fast though, do it slowly. Once it’s all in there, gather up the strainer and squeeze out all the liquid. Works well. I am addicted, haha! I do not even separate it, when it is almost gone I use the settled portion in a smoothie or on oatmeal. I always liked cows milk prior to going vegan but this tastes soooooo much better to me; creamy with the almond aftertaste. YUMMY. I would love to do this. My question, do I have to use the same water that I soaked them with when I put them in the blender or add fresh water? Hi Mira! Nope, use fresh filtered water! Hi! I am making this today and want to freeze some – can you use jam jars to freeze in? Also how long is it good for after defrosting? Thanks! Would it be ok if I use cheesecloth instead nut milk bag? Hi Zayed! We haven’t tried using cheesecloth for this recipe and can’t say for sure. If you experiment with it, report back on how it goes! I made it tonight and I used a cheesecloth. It went wonderfully! Okay, I keep it simple. I don’t strain the milk. I soak the almonds in water to soften them. I then simply take the almonds and add new water and blend in a blender for a minute. I don’t mind any almond pieces that are still in the liquid, I usually don’t even notice any. I don’t add salt because I want to keep my blood pressure low. The recipe was perfect. I was very surprised at how almonds taste after they are soaked, it had a delicious satisfying texture. However, i added chia seeds and extra dates just to be different. Thanks for this recipe. Yay! We are glad you enjoyed the recipe, Mellow! Im a big fan of your blog! I made this almond milk recepie and it turned out pretty good. Quick question though, do you suggest a certain type of almonds for best results? Do you have a favorite brand?? I needed almond milk and I had a big bag of almonds in my fridge. I looked for a recipe and came upon yours, so I made it. I did the quick soak method and used 2 cups of hot water from my Keurig. I covered the bowl with a small baking sheet but anything could’ve worked, I’m sure. Also, I only used 3 cups of filtered water (from my fridge dispenser). I did not have a nut milk bag so I looked up alternate things I could use. On another site, someone mentioned that they used a clean bandana so that is exactly what I used. I added a dash of sea salt and 1 tsp of vanilla extract. The milk tastes DELICIOUS! So much better than store bought! Thanks for your recipe! HI, do you have a recommendation of dish towel to buy? Figured I could try the dish towel first since I want to try making oat mil as well. Thanks! Any thin one will do, like the ones from Ikea. Making this with cashews!! What’s the blender you’re using?? Sorry someone help me. I think I’m doing something wrong because when I make it smells funny? The almonds do after soaking.. do I need special water? Do they need to soak in fridge? It’s been really hot. Hmm it sounds like your almonds may have gone bad, Susie. If you try it again, ensure you use fresh almonds! How would I know if my almonds are bad prior to making it? I buy them in bulk and eat them and taste fine? Hi Susie! If you open your almond container and smell a sour, almost chemical smell, you can bet that the nuts have gone bad. Hope this helps! I buy my almonds in bulk and feeeze them until I’m ready to use them. Otherwise the oil in the almonds will make them rancid. We are now making almond milk regularly. Thank you for great recipe! terrific website – thanks a million for all these goodies! I enjoy your writing so much. I see you have now a Hurom juicer, exactly like mine, and was wondering if you have made almond milk in a juicer instead of blending+straining. Can I freeze it? If so, how long can it be in the freezer? I was thinking to put it in ice cube tray. Yes you can, though we haven’t tried it ourselves! Good luck! Thanks for this recipe! My daughter has to be on a low iodine diet and all store-bought almond milk has sea salt. She was so happy I could make this! Holy! I’ve been making my almond milk wrong. I literally go 1 C of almonds to 2 Cs of water. :) But oh, it’s so creamy and delicious! I have made this twice! I definitely recommend cheese cloth. I like how thin it is, I hate the consistency of store bought almond milk. Yay! We are so glad to hear you enjoyed it, Lindsey! I made this today with 3 cups of water, two dates and a splash of vanilla. I didn’t think I could use up 5 cups on almond milk before it spoiled and I wanted it a bit thicker. I used a nut bag which worked great, reusable and easily cleaned. I’ll probably forgo the dates and vanilla next time so I can taste more of the almond goodness. Planning on making this ASAP :) Is it possible to make forified milk i.e. to add vitamin D, calcium and maybe vitamin B12 to the mix? And how long does the milk keep for in an airtight refrigerated condition? Hi Freya! We have not tried adding vitamins to it and cannot say for sure how that would work. Report back if you give it a try! The milk will keep for up to a few days, though best when fresh. Shake well before drinking, as it tends to separate. Good luck! Followed measurements & instructions and it came out perfect,! It’s really is easy and tasty! I used 4.5 cups to make it Miller with one date and the kids LOVED it!Although buying from the store is cheaper knowing what goes into the almond milk is priceless! Marisol, you can also try this with other nuts and even hemp hearts. Find what nut is most economical for you if you wish to continue to make the milk at home. Almonds are expensive, which is such a bummer. Hello. I just done making this. And i used agave as the sweetener. I soaked my raw organic almonds over night. And somehow the result of milk smell funny. So i cooked the milk in a very low temp. And the funny smell is still there. Is it normal to smell that way? And is ot okey to cook the almond milk? Thank you for the response. Hi! I am not sure what happened.. Perhaps your ingredients were expired / rancid, or the nuts were soaked too long? Tali–is Vitamix less expensive at Costco? Hey! When I was there, the Vitamix E320 was on sale for $300 ($50 off). That sale ended though. The other vitamix models were not on sale. I guess I would say pay attention to their monthly sale flyers. I ended up with a Blendtec because it came with the nut twister jar that was valued at $129 on it’s own, and the Blendtec is much easier to store in small kitchens. Regular price, the Vitamix E320 and Blendtec total blender are the same price but for the nut twister jar that Blendtec comes with. I stood in the Costco aisle agonizing over a vitamix or blend tec. after all my research I finally took a leap of faith to get a blend tec. imagine my joy when you linked to the exact blender I bought! phew!!!!! Your almond milk will be the first thing I make in my new blender :) I am so beyond excited. It’s a little nerdy unreal. Congrats Tali, on your blender! Almond milk is a cinch to make. Is Vitamix less expensive at Costco? Can you share what the cost was? I have been drinking store bought almond milk for years. Although I’ve been told making your own was much tastier and super easy but I never believed it.. I mean its so easy to just buy it! I was so wrong! Making your own is SO much tastier and healthier. With two lattes a day this recipe last me 2-3 days max. I love that I can whip it up in 2 hours (when using boiling water and putting the almonds in a glass container with lid to retain heat). Thanks again for a great recipe! I’m obsessed with your blog and how flavourful and simple your recipes are. You’re the best! Hi dana, thanks for the recipe. If i dont have sea salt, can i pass it? If i dont use sea salt, will it change the taste & texture of milk? What will happen if i use regular salt? How many hours should i soak it on night? 7hours? Should i rinse it after finished soak it? Do you have recipes for the pulp? Goldie, you do not have to use salt at all – you actually don’t need to use any other ingredients other than almonds and water if you don’t want to. The use of salt isn’t important, but if you are following the recipe, I would recommend sea salt and not iodized salt. Sea salt is typically salt in it purest form, right from the sea! The almost should be soaked for, I would say, at least four hours. However, if you have an excellent, high powered blender, soaking for an hour or so in BOILING water will suffice. Some blenders just won’t chop up the almonds well if you haven’t invested in a great blender. So, if you have a “crappy” blender, the longer soaked, the better. I always soak my almonds (or any nut for that matter). Google ‘almond pulp’ recipes. You will find a ton. I use phillips blender.maybe itsnot popular in your place? Can this Almond Milk be frozen? Hi Annie! Yes it can! Thanks so much, it is delish! Can I do this same recipe but with any type of nuts? Yes! You could try it with cashews as well. Additionally, we have other dairy-free milk recipes here. Do you have a recipe for the almond crackers you suggested saving the pulp for? Found them! They’re amazing, too! Hi Adam! Here you go! Hey Dana! My roommates and I started making almond milk in our dorm and after one day it starts to smell horrible even though we have a nice refrigerator. Any suggestions? Hi Conner! Are you making sure to cover it? You don’t want any creepy crawlies in there! Love this recipe! Super creamy and delicious! I follow you on Instagram (minimalistbaker and minimalistdana) and I just want to let you know that I appreciate what you do and the way in which you do it. Your formatting is beautiful and the way you go about sharing your life is too. You are so thorough and help many people with your kitchen expertise. You inspire me each day to make one of your recipes. I am herbivorous and only eat what comes from the Earth and can be made from scratch, so your website is perfect for me: gluten-free, and plant-based. I am trying to get away from consuming additives of any type, and you really make me feel as if I can really achieve that goal, while still loving to eat what I make. I just wanted to let you know how I feel, because this almond milk recipe is the easiest and most straightforward that I’ve seen to date (and thank you for sharing what tools you use to make things, like this nut milk bag). I will be ordering the bag and making this recipe as soon as I can. I just made almond milk for the fist time following these instructions. Can’t believe how easy and delicious it is! Way better than store-bought. Thank you! I put less water in the blender (approx 3 cups) so it would be a little thicker and use it as a coffee creamer. You can add your favorite flavor(s) if you want to during the blending process. Very delicious alternative. homemade almond milk always separates because its natural. I have been following you for awhile now and absolutely am a huge fan. I have made/ switched up plenty of your recipes in the past, but by far my favorite are the yougurt (make 3 successful batches) and now the almond milk recipe. Your recipes have everything I am looking for and not everything in them. Simple, clean, whole and eco friendly. Thank you for your work and inspiration! Hi! 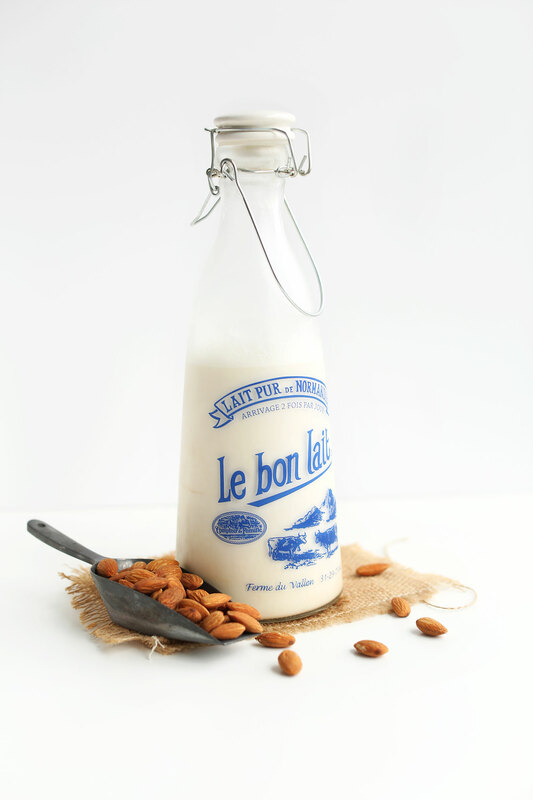 This may be a silly question- but why do we discard the milk used to soak the nuts in? Thanks!! Hi! If you are referring to the almond pulp when you say milk, here is a recipe you can use the pulp in that others have had success with! Let us know how it goes! If you mean soaking water, discard it because it contains anti-nutrients. Or use it in the garden! I’ve made this twice, and it’s fantastic. I plan on making this every week, and it’s so easy. I used tap water, and I did one batch by soaking the almonds over night and another batch in boiling water for two hours (both batches turned out the same). One batch I also used 1.5 cups of almonds and 7.5 cups of water to give us a little more for cooking. I recently also made Dana’s vegan chocolate ice cream (which is truly phenomenal). I kept some of the chilled base, added it to a blender with the almond milk, and made my 5 year old chocolate milk, which blew her mind. Also, making almond meal with the pulp is easy! I take the pulp (what’s left over after straining out the almond milk), spread it on a cookie sheet, and bake it in the oven for two hours at 170 (I take it out a few times and stir it to break it up and make sure it doesn’t stick). Then, I grind it in a food processor for a bit until it’s fine (not as fine as coconut flour, but it’s definitely almond meal). I plan on using it in recipes that call for almond meal (Dana’s Almond Meal Cookies with Chocolate Chips and Coconut recipe will be what I make next.) So, I get almond milk and free almond meal that I can use to cook. Yay! Let me know if anyone has actually cooked with the almond meal and I’ll do the same! Made this!! And it’s expectacular. Did the soaking of the almonds for two days. Then put almonds in blender along with two cups of water. All I know I’ve been having rich creamy almond milk. The best!!! I decided. It use any of the other recommended stuff because I simply wanted almond milk for my coffee hehehe. Definitely recommend this recipe. cookies. Will definitely make this every week and thanks Dana! Does an overnight soak mean 8 hours or 24 hours? Hi! 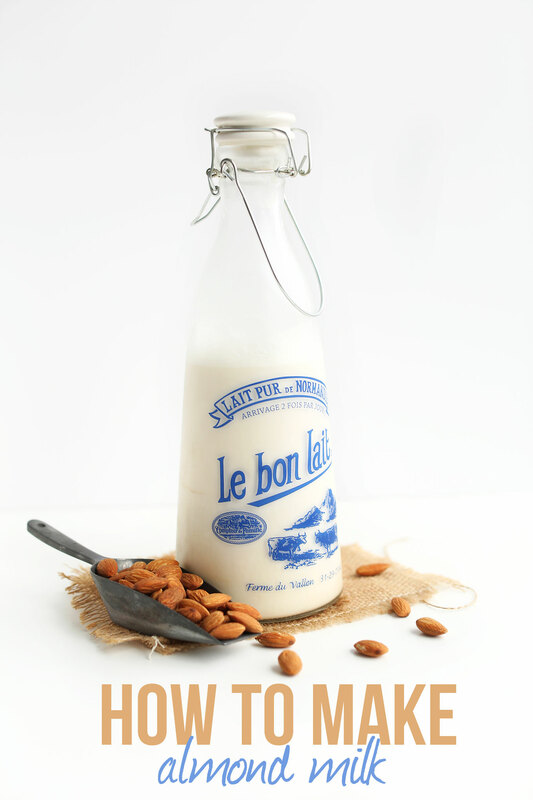 Soak them a minimum of 8 hours, the longer you soak the almonds the creamier the milk will be! I would like to copy and paste the recipe for vanilla almond milk and am unable to copy. Is this a policy of yours. It just makes it easier to make. I also signed up for your emails and very much appreciate healthy choices and I am vegan so I am thrilled with your vegan recipes! Hi! Hmm it may be something on your end, it works for us! Why do you have to discard the soaking water? Made with prunes and it tasted delicious!!! Cant wait to read and find out more recipes on your blog. Thank you!!! So easy and SO delicious. I did slip off the almond skins before I blended them with the water, but next time Ill try without doing and see if there is much difference. I only have Magic Bullet blender, so I had to blend in increments, but it worked fine – and the taste – so fresh! I can’t imagine ever buying store bought again. Thank you for posting! Hi Dana, do you find that soaking the almonds in hot water for 1-2 hours changes the quality or taste of the milk as opposed to soaking them overnight? I’ve done it both ways — soaked overnight and soaked for two hours in boiling water — and it came out the same. It was the same taste and consistency. Hope that helps! I just made this for the first time but only had half a cup almonds left, so I added a half cup of cashews and it turned out so yummy!!! I’m having it with my cereal right now. I love that it’s simple and quick to do this myself instead of having to dash to the store just for milk. You mentioned it will last a few days, are you saying it becomes questionable to drink or it just isn’t fresh anymore, what would you say is a good maximized shelf life. This calls for filtered water, would it be ok to use tap water? If I store the almonds for a couple of days and then make another batch, do I need to resoak them at all or will they be okay dry? They should be OK, just keep them in the fridge! How hot should the water be to soak for just 1-2 hours. Like a constant boil for 1-2hours ? Hi Carri! I think that by doing that, you’ll speed up the softening process quickly! I forgot to rate this, so re-posting! I compared a few recipes for almond milk and chose yours! So easy and I’m thrilled with the results! Thanks! I compared a few recipes for almond milk and chose yours! It was so easy and I am thrilled with the results! Thanks! Can I use a regular blender or food processor, or do I need a high power blender? Thanks! Hi Chloe, a high power blender will definitely make things easier but your regular blender should work! For your readers – I make almond milk every week. When I want a nice warm drink in the evening. I warm a cup of almond milk for about 5 minutes on the stove. Don’t boil – – but warm until a fine white foam begins to spread across the top of the milk. Stir constantly but gently and pretty soon the milk begins to thicken. It will slightly coat the back of a spoon. Remove from heat and flavor as you like. This warming also produces a slight froth. Its true that warming the milk defeats the purpose of the “raw” almonds used but hey, when you want a yummy, creamy and satisfying drink try it. Do you have any recipe recommendations for what to do with the almond pulp afterwards? Hate to throw it away ? I have some roasted, salted almonds. Will they work? Hi Kathy! For this recipe, raw almonds are needed! Good luck! I feel fortunate to have found your almond milk recipe. I’ve been purchasing Silk brand for a long time, and thoes 10+ ingredients were really starting to bug me, specially the gum ingredients. Anyhow, I decided to make my own almond milk, and after coming across your recipe I made it in my Vitamix. This recipe is a great swap for me. It taste good and now I know exactly what’s in my milk. And I love how it’s still thick and creamy. I thought it was going to be less creamy without the gum ingredients that Silk brand adds to thier milks, but it wasn’t! And a other great thing is that it froths well with my electric whip. Thanks to you I now get to have clean and great tasting matcha latte every morning. P.S. I have never left a comment on a blog or recipe before, but you deserve your five stars. I’ll be looking for more of your recipes. How did you estimate the nutritional information for this recipe? I love making almond milk but I am always wandering how much fat it contains as I don’t really know how much fat/protein/carbs remain in the strained pulp.. If allergic to Almonds, can another nut be substituted instead? Hi! I haven’t tried it but cashews might work with this recipe! If you give it a try, let me know how it goes! Hi! I don’t have the nutritional info without the dates – if you do make it without them, it will change the taste of the almond milk so keep that in mind! No cashew milk recipe yet! Happy cooking! Thank you! I’m so tired of buying stuff with added crap that I’ve been searching for ways to make my own. This is so easy! I use a paint straining bag (wash prior to use!) to strain my homemade yogurt (I like really thick “Greek” yogurt) and it works great as a nut milk bag as well. The bags come in packs of 2 and are around $5 @ Home Depot or Lowe’s. This homemade almond milk tastes much better than the stuff in the plastic jug from the grocery and I love that I control what goes in it! I just wanna mention something important about almond milk. Some doctors will say to avoid it if you have issues with thyroid because it’s not good for it. in that case just heat the almond in low heat as possible after soaking it in water,google the safest way to do it, this helps with removing the unwanted natural chemical elements that will have a bad effect on thyroids. just a small note to people who have issues with thyroids like me. great blog and recipes Dana. Wow! Thank you for that wannabeV! My hubby has thyroid issues. I will check it out! I took the one cup literally meaning 8oz of almonds (I initially found the recipe on another site), and 112 grams is approximately 4. According to your recipe and if I use the 8oz, that’s going to make 10 cups of almond milk which I just don’t think I’ll be able to drink within a few days. 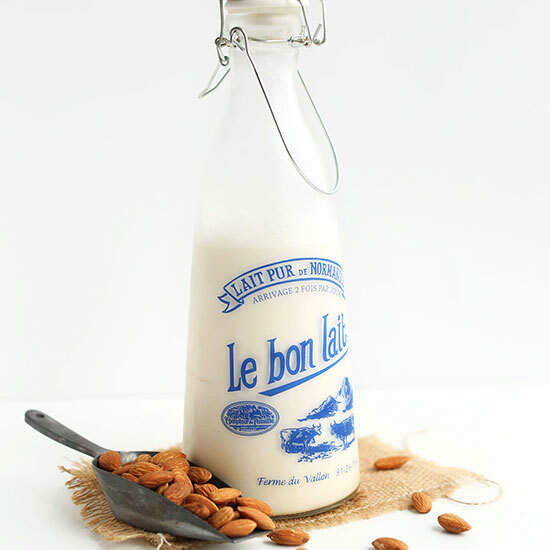 Can the soaked almonds or the milk (or both) be frozen? My guess would be yes considering it’s just water and almonds but I don’t want to waste anything and I’d rather be safe than sorry. Also, regarding the leftover almonds after being pulverized, can they be dehydrated and made into a powder or would the residual oils (if any) prevent this? Would it make more sense to add the vanilla, salt, and sweetener after it has been blended and stranied? Otherwise you’re just basically straining these ingredients out. Sure! You certainly can. But I do think the flavors remain even when blended before straining. One use for leftover almond pulp. First blend the almonds for long time while making the almond milk. Second. strain the pulp. Third, add a little salt and enough almond milk to make a firm cream cheese texture. Then put in 80 – 90 degrees to ferment for 12 to 24 hours. Comes out like a vegan cream cheese spread. Can also mix in a little powdered vegan probiotics or vegan yogurt or sour cream etc. to it before fermenting. Great in cheesecake. great! finally found out what is one cup of almonds equal to grams !! thanks !! I give the pulp to my dog- they all LOVE it! Hello, I just found your blog! I can’t wait to check out more of it. Its been a long while since I’ve made almond milk so I googled to double check on the average of added water that most recipes called for and came across your recipe. I just wanted to mention that I found that coconut oil helps to emulsify and there is a nice froth for that very first cup of Joe right after making the milk. I also make my milk with my slow masticating juicer. Then I pour it through a strainer a couple of times to remove the pulp. I realized today if I only mixed 2 cups of water with nuts through the juicer, then straining would be quicker. So after straining, I then added 3 more cups of water, then put through blender with vanilla, coconut oil, etc. Do I discard the soaking water? Should I use distilled water? Just made your kale sweat potato curry tonight and it’s absolute fabulous! I took your advice and really loaded up on spice. Do you have recipes for golden milk? Yes, discard the soaking water, rinse almonds, then add new filtered water. I don’t have a traditional golden milk recipe, but I do have these two variations. Good luck! Anyone got any recipe for making cookies with the leftover pulp? Thanks a million! You could try this one! Have searched for a good almond milk recipe for ages. This is tasty, simple and luscious. Thank you very much! Do you soak the almonds in the 5 cups of water listed in the recipe, or do you pour off the soaking water and use fresh to make the milk? Good question. Just cover the almonds for soaking. Then drain and add 5 cups for blending! Why drain off the almond soaking water? Why not use it in the recipe? I sweeten with added Sweet Leaf Stevia bought online in English Toffee flavor. I also like a bit of vanilla. Vitamix everything with fresh tumeric and ginger root (ground if not fresh available) and strain. Then I utilizes empty saved Kombucha glass bottles to store for ALMO storage. If you added ground chia or hemp and double strain, it thickens it nicely. Lovely color–creamy and healthy with a woodsy/toffee/ginger/vanilla /nutty flavor. Soon, pecans will be ready to harvest. Looking forward to trying this as “milk”. I wonder how lightly roasting the almonds or pecans will effect end taste? Has anyone tried that? can we use our leftover almond meal for making these gluten free cookies. What do you do with the almond pulp? Recipes with these almond pulp? Is that what almond meal is? Mmmm freshly made almond milk sounds delicious! I love almond milk, as well as this recipe! I was just wondering how long I can store it in the fridge though? Usually I try to make enough almond milk for the weekday but on the 5th day it doesn’t seem as fresh anymore? I wonder if mine went bad =/ Thanks! Great blog and recipes, Thankyou! I wondered if the nutritional analysis provided is for your exact recipe (I.e. Including the dates?) or is it for the unsweetened version? Thankyou. Hi there! Just used this recipe for my first batch of almond milk and it’s awesome! I kept my pulp, do you have a recipe for those crackers you mentioned, or for anything else? Thanks!! What are some suggestions to use the ground up almonds (after straining) instead of wasting them? I changed it up and used 3 cups filtered water, 1 c skinless, soaked almonds, 1tsp vanilla and 1 tsp honey and a dash of salt and did not strain it! Delicious, thanks for the inspiration! how can I make my almond milk last longer!? Fresh just doesn’t last as long. You can try freezing it though! Ahhh! Is there anything in the gum work or fermented things like App cider vinegar or guar gum xantham gum that would help or do I would absolutely rediculous?! Definitely going to try this at the weekend. So excited. I meant to give five stars but pressed send by mistake !! Thank you so much for this recipe. I’ve been making my own almond milk for six months now. I tend to make half the amount each time as it doesn’t keep so long as commercially made milk. With such a great creamy taste, I don’t think I could ever go back to shop bought milk. Thank you once again. A great strainer for homemade almond milk is a knee-high nylon stocking (clean, of course). The milk comes out perfectly smooth and delicious! Just soaked my almonds. So excited to try this out! I think a good use for the pulp would also be great in cereals or oatmeal. It is….I tried it in my grain cereal this morning…just a tablespoon or two for this first experiment. I tried this technique yesterday and let me tell you this was amazing! I live in France and almond milk is not a thing (yet at least) so it is very expensive and you can only find it in selected stores..but you can find raw almonds everywhere! I also love your bottle with the French writting.. I have a blog (written in English) and I’m including this how to in my weekly favorites this week for sure! Just started making this and I love it cold, but it separates when I add it to a hot drink. Any idea how to prevent curdling? Hmm, can you heat it slightly before adding to a hot drink? I haven’t tried it yet, but from what I’ve read online, if you simmer the milk for 10-15 minutes, it won’t separate as much or curdle. Hi Dana! Thanks so much for this recipe!! I’m really enjoying making it and tweaking it slightly to my own needs for various occasions. I was wondering, how did you calculate the nutrition information for it considering the almond pulp is removed? Thankd again for all you do, I wouldn’t be surviving college without you and your blog! I just made an estimation based on other all-natural almond milks and the one I made. Glad you’re enjoying it! I’ve started making this WEEKLY. I haven’t yet found a great recipe for my almond meal though, so it’s been going in the bin… hoping to find something before the latest batch goes south! I find the more sugars I add (i.e. more dates vs none), the faster and more intensely the milk turns sour. I cannot wait to try the strawberry version! Skinning the almonds seems to make little to no difference in the milk, but my almond meal is a nice, pure white color which might be better for baking/using later. The nut milk bag has changed my life! I typically use the pulp in homemade granola…. I have NEVER tried this recipe before, but something like this…. The pulp is super easy to incorporate into any granola recipe. Love the post! Where would I find a bottle like this? thx for sharing this recipe – that´s a great idea. Making almond milk by yourself instead of buying an expensive one. Hello! just wondering how long this will last in the fridge and also recommended storage? Can you freeze it? Will it be ok after defrosting? Yes, you can freeze for up to 1 month! LOVE this! I had been putting off trying to make this from another recipe, then started exploring your blog and tried it with the vanilla and sea salt – awesome, and so much better than store-bought. Plus, I dried out the leftover meal and made your almond-banana muffins with it – also yummy. Thanks for all the new recipes to explore! I meant to give it 5 stars, and to write “delish”, not “relish”??!! I made this for the first time last week and LOVED it! Have been dairy-free for almost a year, and the shop-bought almond milk is a bit too sweet and slimy for my taste. This was relish, especially in coffee. With the pulp, I would recommend adding it to homemade granola. Yum! everytime i make this milk it separates & a large goo of almond gets at the top while the water hangs out at the bottom. Do you have any tips to avoid this. Confession: I usually use 1 cup almond to 3 cups water. Do you think the thickness is messing me up? I’d recommend 2 more cups of water, blending until VERY smooth (4 minutes depending on the blender), and shaking well before pouring! Separation is natural with homemade versions. Good luck! HI Robert, can you buy milled almonds or is this a process you have to do yourself? I have thought the same thing Kathy about the calcium intake. I would like to know also. I know this thread is old and perhaps have you found a solution? Hi, Teresa, I’m a nutrition student, so I thought I’d help you out on your question about calcium. If you are worried about calcium intakes, you can certainly continue to drink fortified plant milks or other fortified foods (such as cereals), but you could also look to natural plant sources of calcium to get your daily needs. Try incorporating broccoli, bok choy, and/or tofu into your daily meal plan to meet your needs. Tofu is great source of calcium because it is made with calcium sulfate. Also make sure you are meeting your Vitamin D requirements to ensure proper and optimal absorption of calcium. Hope that helps! Broccoli & bok choy are good sources of calcium, but I’ve read in a number of places that unfermented soy isn’t so good for us. Tofu, which seems like it’s fermented, actually isn’t, so according to all I’ve read, it should be avoided or at least minimized. (Lots of websites talk about the problems with soy. You can check out Dr. Mercola as one example.) Tempe is made from fermented soybeans, but it’s harder to find. I don’t know anything about whether it’s a good source of calcium. Hey Teresa, I know I’m a bit late. I’ve talked to some nutritionists with completed degrees and they said One cup of almond milk provides almost 50% of your daily calcium needs. If you are worried about too much calcium, drink a spoonful of apple cider vinegar (in 4–8oz of water, NOT By itself) so your body can properly metabolize and use the calcium so it doesn’t cause issues. You can use the left over pulp in muffins, quick breads or add it to smoothies. Hope this helps. If you dehydrate the pulp (in oven lowest setting or dehydrator) and then put it in food processor (or dry bucket of Vitamix blender) you make Almond flour! And around here it is really expensive, so this is a no brainer! Thank you, I was just wondering if I could dehydrate it. Taking a few extra minutes to slip the skins off of the almonds after they have been soaked makes for a clean, neutral almond milk. This is such a great suggestion, it made for such an amazing milk! And the pulp was so smooth, I just threw it in the Dahl I was making for dinner, it was so good! Can I please have your Dahl recipe thank you ???? I absolutely love this recipe in a cup of hot tea. I made some today and I am already almost out of milk! Great recipe! Love your blog! I love the simplicity of your recipes! I usually have everything I need in my pantry already! Do you have any tips about frothing homemade almond milk? It doesn’t really work, so I was thinking… what if I add a pinch of soya lecitin or another natural thickener? Have you ever tried experimenting for cappuccino? Grazie, from Italy! Hmm, that might work! You could also try making your almond milk a little thicker so it will have more body (more almonds, less water. Good luck! So jealous you live in Italy! I want to visit! :) if you do… please let me know! Aquafaba is the natural thickener you’re looking for! I add 1 tsp of aquafaba to my Nespresso frother along with the milk and it does the trick! OMG, what can Aquafaba NOT do? All the milk alternatives I have tried at home have not performed well in my frother, I am overjoyed to have seen this comment! Thanks!! I make my own almond milk almost every other day but as well as the almonds I also add 1/4 C hemp hearts and 1/4 C unsweetened coconut. After I’ve strained my milk I put it back in the vitamix and blend for a few seconds for a super frothy drink. Yum! Those things are handy, but the problem here isn’t really the tool — it’s that almond milk just doesn’t create froth the way milk does, no matter what sort of frother or steamer you use. Mine froths up lovely using this tool…. Maybe your almond milk is too watery? (if you think about it, water won’t ever froth) Try making it stronger. ie. more almonds, less water. Just a thought. Can I use almond flour, and skip the step of soaking the almonds? Sorry Heidi, that wouldn’t yield the same results! Yes, there are lots of recipes online for using almond flour. However the quickest way is to put several big globs (“big” spoonfulls) of almond butter and however much water is desired into a Vitamix. For comparison, if making almond milk from whole almonds, you have the choice of sitting there popping off all those skins one at a time to get really white milk, or leaving the skins on and getting a more “ecru”-colored milk with brown flecks in it. Neither is “bad”: it just depends on your preference. One reason I make homemade almond milk is to avoid sweeteners. I have found that the taste of plain almond milk has a bit of an “edge” to it, but by adding a tiny pinch of Celtic salt and a little bit of coconut water “smooths out” the flavor. I have froth store bought almond milk and with some time it forthed but not the same consistency. I made almond milk yesterday but defunaltey does not froth like cashew milk does. I think homemade cashew milk is the best nut milk for coffee, it’s really creamy. Hi Dana, I just made the almond milk and am so glad I did. It feels so good to know that I made it all my myself and by doing so it feels much more real!! I love all your recipes and I am a vegan so your website has definitely saved me more then a few times in the cooking department, xo a big fan. SO wonderful! Glad you enjoyed it. Thanks for sharing, Charlotte! Tried using thin sliced almonds because I had an excess when moving the almonds from a bag to container and figured, why not give it a try. After soaking, I poured them into my home blender and added 2 cups of water because that’s all the room I had. Blended for awhile. Took a quick slip before draining and it seemed watery. Later I will run the blender some more an drain. Any suggestions other than whole almonds? Hi Dana! First off, I absolutely adore your blog- it is a wonderful resource that I can use to find healthier ways of eating. I was wondering abound your instruction saying that you can flavor your milk to be strawberry or banana- how do you do that? Thank you! Sure! For banana, add half a ripe banana, blend and strain per usual. Add more for a more intense flavor. For strawberry, add 1 cup ripe strawberries, blend and strain per usual. Sweeten as needed with dates. Thanks Judee! Glad you enjoyed it! Awesome, I’m going to make mine too! What do you store yours in?